Hmm, this is an interesting story behind a very interesting premise. I wish everyone good luck in April! It's grown so much in just two years! I'm already imagining the thousands who will sign on next year! This is so cool. I remember watching last year. It seems like some ideas are greater than the sum of their parts. I think the A to Z challenge may be one of those. Alex, Thanks again for having me hear today. I'll be monitoring in case there are any special questions. But for those who've commmented so far: Thank you for stopping. And just remember it's all for fun, but you can use the Challenge to try to meet your own goals. Don't stress. Well you learn something ev eryday. I didn't know I was the first to sign up last year on the A to Z. Great post Lee thanks for taking the time to write and thanks to Alex for hosting Lee. This is my first time signing up for the challenge- but its great to see so many signing up- a little daunting- but hey- we all will make it through one day at a time! This is my first time signing up for this challenge. I'm a little scared. :) Do you have a place to look at a sample post or an idea brainstorming post? Thanks! I'm excited! Lee, thanks for guesting here! Ciara, you can go back to my posts from last year to get an idea. And a brainstorming post is a good idea - I'll make it happen soon. Lee and Alex, thanks for sharing the story! Have a great week! Love hearing how this all began. I have a question. Do you try to put blogfest participants on your own blog or only the ones you manage to follow. I can't imagine adding 400 new blogs to my blog roll. I signed up right away. I'm really looking forward to it. Since I blog everyday, I hope to have some fun stories to add. I didn't realize last year's was so off the cuff and organized in a week! Thanks, Arlee and Alex! It was interesting to learn the story behind this amazing blog challenge. That's an interesting story. I'm impressed with the numbers on such short notice. Ooh, I've signed up!! ;-) It's going be quite a challenge but I shall definitely give it my best! Ciara --You can likewise look at my 2010 April archives to see my samples. There are so many ways that you can approach it. Alex -- A Brainstorming post would be a good idea. Karen Walker-- Last year I put all the participants in my sidebar where they mostly still are. You'll have to find what works best for you. I'm really not sure how the best way to handle it is though-- it's a lot of blogs to sort thru. That's probably why it's good to get an early start exploring them. Maybe organize them into Google Reader files? I've never done this, but I think there is a way to go about this. I wonder if anyone else has a good suggestion? Nicki -- It's not a matter of wanting to do the Challenge, you have to do it or you'll regret it later. Laura -- Yes, it was a very spontaneous idea and it surprised me when I saw how well it was initially received. As soon as I saw the positive response last year I started really pushing it. I'm glad I did. Jamie -- You'll be sorry if you don't join us. We'll be singing "Jamie's crying". Boo hoo! Jules -- a nice long walk can be good for stimulating thought and ideas. Maybe you should take a long walk--hmmm, maybe that didn't sound right. All I can say is, Sign up! Sign up! Sign up! Thanks for bringing us the A to Z story Alex and Arlee. Nicki, just do it! you will regret it if you don't. Thanks everyone for visiting today! I'm still not sure I can so this, but it sure is a great idea. I love the backstory. Have fun. If you do it again next year, I'll try to plan better so I can participate. Woooo! Great story - thanks for sharing, Lee! I can't wait for April. Great 'birth of a great idea' story. Looking forward to it. Altho, I haven't quite figured out what I'm going to do yet. Have fun with the blogfest! Can't wait to see what everyone has in store for their posts. Pat, you can do it! Carol, I hope you can next year. M Pax, I'm sure it will hit you soon. RaShelle, you can do it! And you don't want to miss my letter A. Very cool! Can't wait to see everyone's entries in April! Nice to hear the story of the very beginning, and it's a good story too. I was a blogger babe when the first challenge started. I was too shy to join in. I regretted it. Great to learn its origin. Enjoyed the history lesson and your enthusiasm. I’m still happy to sit on the sidelines and be a cheerleader of sorts. Go A to Zers! I am pretty excited to be participating with a pretty great group of bloggers. I think this is going to be a lot of fun! Almost @ 500 - yahoo! I've got my 26 posts scheduled to go live starting April Fool's Day. Looking forward to meeting muchos bloggers nuevos. Cool behind the story post. Lynda, won't make that mistake twice I'm sure! Ella, really glad you're a part of it. Chuck, it's going to rock! Milo, I'm almost there as well. Excellent origins story. I'm looking forward to seeing what everyone comes up with. Mine was a fairly easy thing to come up with as I've taken a World of the Scribe staple theme and turned it into the running theme for all of next month, going about it alphabetically, of course. I love that the inspiration happened during a walk. We're all the better for it. What a great story! I often feel I'm a lousy blogger because I don't give enough away. But, I really appreciate my followers. Had to leave for a few hours and come back to all of these wonderful comments. I thank you one and all for the kind words. Appreciate all those who have already committed themselves to the Challenge. As for the rest of you--well--you still have a couple weeks to change your mind. It's gonnnna beeee funnn!!! It's good to read about stories like that, it must be an amazing experience to see how your idea has grown! I'm so prepared, I already have started planning - which I rarely do, but I'm pushing myself more and more these days in writing so planning has become essential. :) Good times. Sure glad the friendship connection was made. While I don't participate in A to Z, I sure enjoy reading them. Like Lee said, the challenge is an opportunity to make new blogging friends and improve ourselves as bloggers. I'm looking forward to meeting lots of people and will stop by every blog at least once. Jeffrey, I chose a theme this year as well, which has made it so easy! Clarissa, you do a lot for other people! Wordyliving, that planning will pay off. Stephen, my plan is every blog at least once as well! Cool story! I am still unsure as to whether I can commit to that... sounds like fun though! It's a great idea, Lee. Thanks for sharing your story! Marvin, Lee is da man! You're an inspiration, Arlee. I can't wait for the challenge to start. How cool, and look where it is now! I have to come back for one more comment. 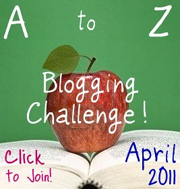 Saw that we have 490 participants for the April 2011 A to Z Challenge! I knew we could do it! Tomorrow I'll do another Facebook shout out to all my author friends (over 1,000) and hopefully we'll hit 500 in the next day or two. Holy smokes! I'm flabbergasted that 100 people signed up so quickly! It's a great idea, though. I'm signed up! Yay!